Petermann Fjord connects Petermann Gletscher to Nares Strait which in turn is connected to the Arctic Ocean in north and the Atlantic Ocean in the south (Figure-2). The track of Petermann ice island PII-2010A emphasizes this connection as the 60 meter thick section of the ice island reaches the Labrador Sea in the south within a year after its calving in 2010. 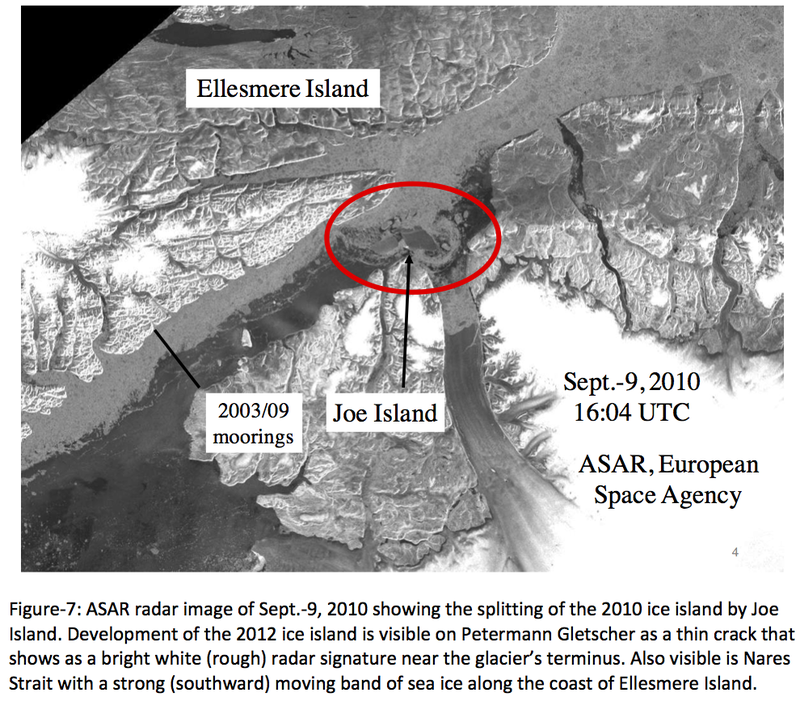 PII-2010 left Petermann Fjord on the 9th of September in 2010 when it broke into segments A and B while pivoting around a real island. It flushed out of Nares Strait 10 days later when an ice-tracking beacon was placed to track the ice island. 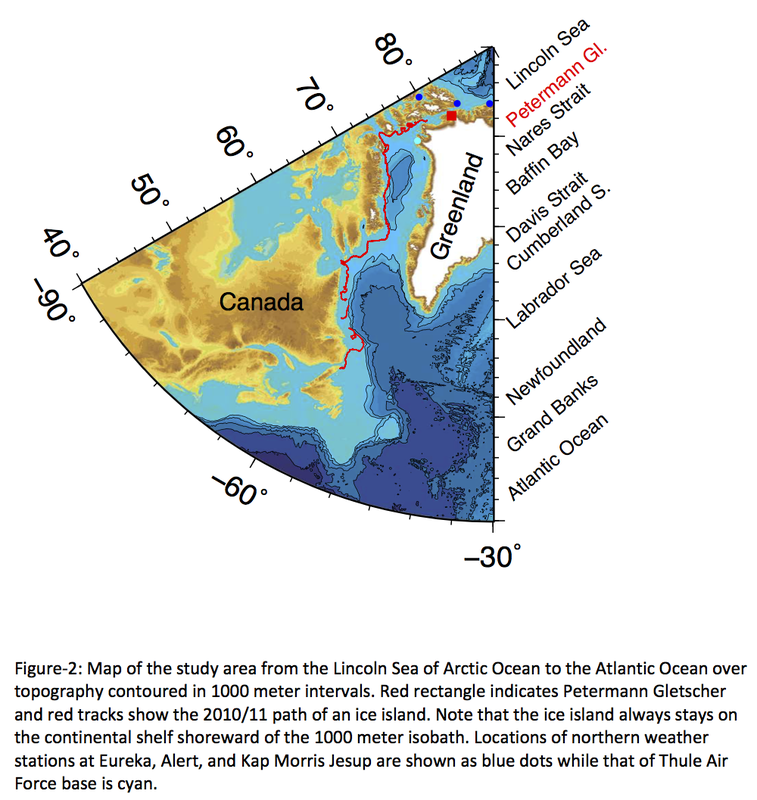 The ~60 m thick segment PII-2010A moved southward with the Baffin Island Current (Münchow et al., 2015) at an average speed of ~ 0.11 m/s past Davis Strait. Remaining on the continental shelf of the Labrador Sea, it passed Boas’ Cumberland Sound, Labrador, and reached Newfoundland in August 2011 when it melted away in a coastal cove about 3000 km from Petermann Fjord (Figure-2). Petermann Gletscher drains about 4% of the Greenland ice sheet via a network of channels and streams that extend about 750 km landward from the grounding line (Bamber et al., 2013). The glacier goes afloat at the grounding zone where bedrock, till, and ice meet the ocean waters about 600 meter below sea level (Rignot, 1996). Figure-3 shows a section of surface elevation from a laser altimeter flown on a repeat path along the glacier in April 2013 and May 2014 as part of NASA’s Operation IceBridge. Assuming hydrostatic balance, we also show basal topography below the sea surface that varies from 200 meters at the terminus to 600 meters at the grounding zone near distance zero (Figure-3). The 2013 profile has been shifted seaward by 1.25 km to match the terminus position. Note the close correspondence of large and small crevasses in 2013 and 2014 near 20, 40, and 45 km from the grounding zone. The seaward shift of the 2013 relative to the 2014 profile implies a uniform glacier speed of about 1180 meters per year. This value is almost identical to the 1170 meters per year that we measure between 20th August of 2015 and 11th February of 2016 with a single-frequency GPS placed about 13 km seaward of the grounding zone as part of the ocean weather observatory. 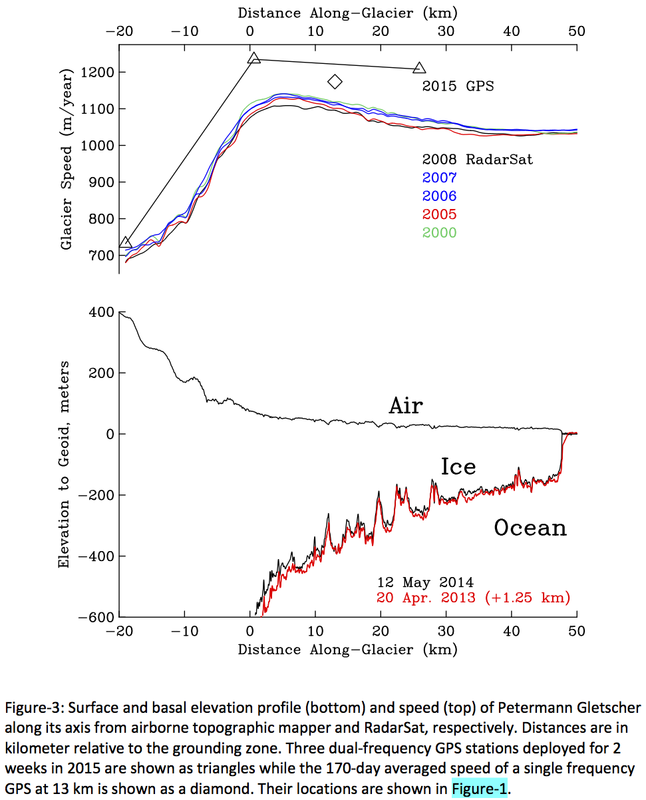 Speed of Petermann Gletscher for the 2008/09 period from RadarSat interferometry (Joughin et al., 2010). Symbols indicate dual frequency GPS position. Black line near lower center across the glacier indicates the grounding zone. Speed of Petermann Gletscher for the 2000/01 period from RadarSat interferometry (Joughin et al., 2010). Symbols indicate dual frequency GPS position. Black line near lower center across the glacier indicates the grounding zone. Figure-3 shows that glacier speeds before 2010 are stable at about 1050 m/y, but increased by about 11% after the 2010 and 2012 calving events. This increase is similar to the size of seasonal variations of glacier motions. Each summer Petermann Gletscher speeds up, because surface meltwater percolates to the bedrock, increases lubrication, and thus reduces vertical friction (Nick et al., 2012). 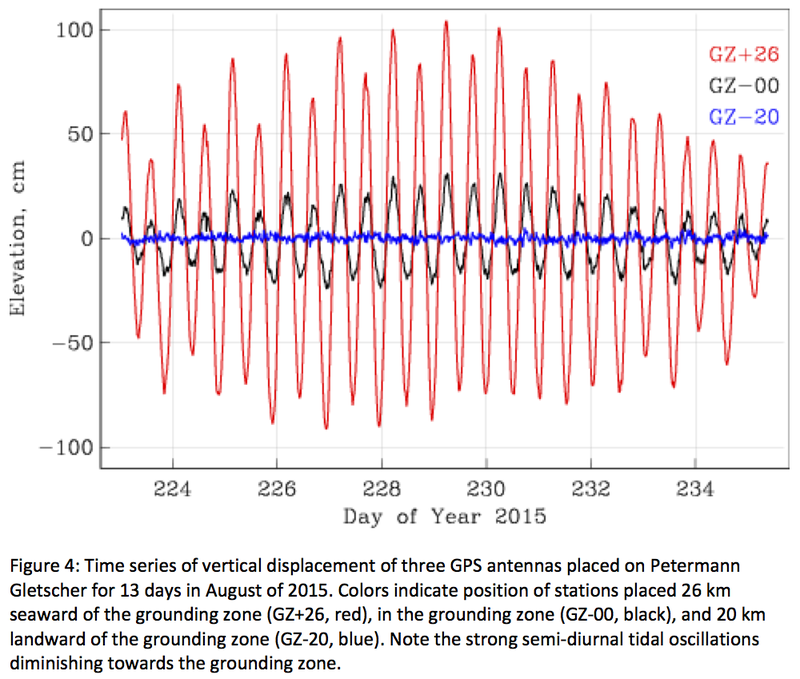 Figure 3 presents summer velocity estimates for August of 2015 from three dual-frequency GPS. The along-glacier velocity profiles measured by these geodetic sensors in the summer follow the shape of the 2000 to 2008 winter record, however, its speeds are about 10% larger and reach 1250 m/y near the grounding zone (Figure 3). Petermann Gletscher August 10, 2015 with center channel in foreground. UNAVCO GPS systems for deployment on Petermann Gletscher. Petermann Gletscher at dawn on 5 Oct. 2015 as captured by NASA Operation IceBridge. Our Ocean Weather Station is in the corner bottom left. Terminus of Petermann Gletscher with Hubert (right), Belgrave (center), and Un-Named (left) Glaciers coming in from Hall Land in the north. The ocean is to the left (west). View across Petermann Gletscher from west to east near Site-C where we deployed two ocean sensors on Aug.-9, 2015. Uncertainty in velocity of these GPS systems is about 1 m/y which we estimate from two bed rock reference stations 82 km apart. Our ice shelf observations are referenced to one of these two semi-permanent geodetic stations. Its location at Kap Schoubye is shown in Figure-1. Data were processed using the GAMIT/TRACK software distributed by MIT following methodology outlined by King (2004) to archive vertical accuracy of 2-3 centimeters which, we show next, is small relative to tidal displacements that reach 2 meters in the vertical. 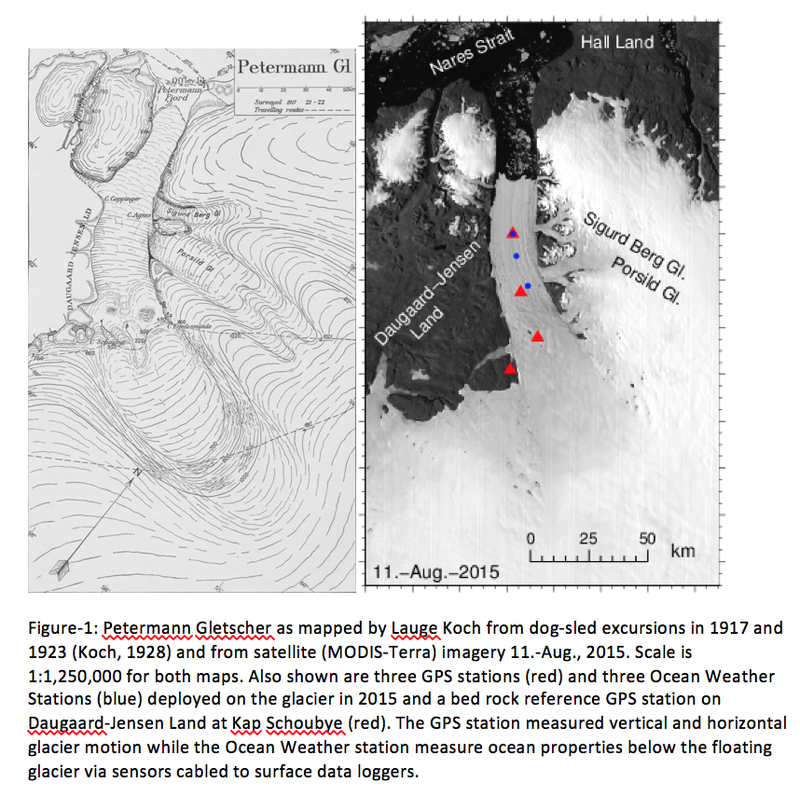 Figure-4 shows the entire 13 day long record of vertical glacier displacement from 30 seconds GPS measurements in August of 2015. The observed range of vertical glacier displacements diminishes from almost 2 meters about 26 km seaward of the grounding zone (GZ+26) via 0.6 meters in the grounding zone (GZ-00) to nil 20 km landward of the grounding zone (GZ-20). 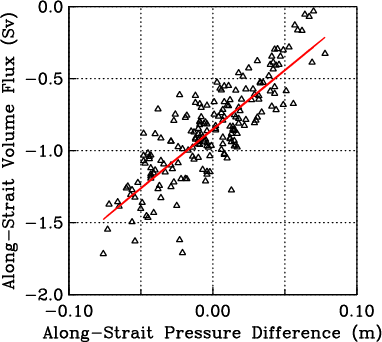 Anomalies of horizontal displacement are largest at GZ-00 with a range of 0.2 m (not shown) in phase with vertical oscillations (Figure-4). More specifically, at GZ+26 we find the ice shelf to move up and down almost 2 meters roughly twice each day. This is the dominant semi-diurnal M2 tide which has a period of 12.42 hours. Notice that for each day there is also a diurnal inequality in this oscillation, that is, the two maximal (minimal) elevations oscillate from a higher to a lower High (Low) water. This is the diurnal K1 tide which has a period of 23.93 hours. And finally, all amplitudes appear modulated by some longer period that appears close to the record length of almost two weeks. This is the spring-neap cycle that is caused by a second semi-diurnal S2 tide that has a period of 12.00 hours. A formal harmonic analysis to estimate the amplitude and phases of sinusoidal oscillations at M2, K1, S2 and many more tidal constituents will be published elsewhere for both Petermann Fjord and Nares Strait. 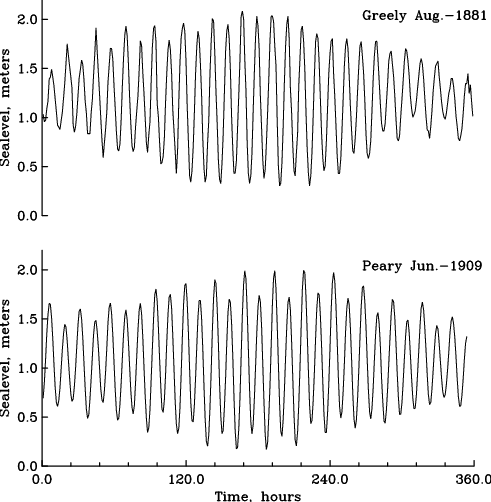 Preliminary results (not shown) reveal that the amplitudes and phases of the tidal signals at GZ+26 are identical to those observed off Ellesmere Island at 81.7 N latitude in both the 19th (Greely, 1888) and 21st century. In summary, both historical and modern observations reveal real change in the extent of the ice shelf that moves at tidal, seasonal, and interannual time scales in response to both local and remote forcing at these times scales. Future studies will more comprehensively quantify both the time rate of change and its forcing via formal time series analyses. P.S. : This is the second in a series of four essays that I am currently developing into a peer-reviewed submission to the Oceanography Magazine of the Oceanography Society. The work is funded by NASA and NSF with grants to the University of Delaware. Bamber, J.L., M.J. Siegert, J.A. Griggs, S. J. Marshall, and G. Spada. 2013. Palefluvial mega-canyon beneath the central Greenland ice sheet. Science 341: 997-999. Greely, A.W. 1888. Report on the Proceedings of the United States Expedition to Lady Franklin Bay, Grinnell Land. Government Printing Office, Washington, DC. Joughin, I., B.E. Smith, I.M. Howat, T. Scambos, and T. Moon. 2010. Greenland flow variability from ice-sheet wide velocity mapping. Journal of Glaciology 56 (197): 415-430. King, B. 2004. Rigorous GPS data-processing strategies for glaciological applications. Journal of Glaciology 50 (171): 601–607. Münchow, A., K.K. Falkner, and H. Melling. 2015. Baffin Island and West Greenland current systems in northern Baffin Bay. Progress in Oceanography 132: 305-317. Nick, F.M., A. Luckman, A. Vieli, C.J. Van Der Veen, D. Van As, R.S.W. Van De Wal, F. Pattyn, A.L. Hubbard, and D. Floricioiu. 2012. The response of Petermann Glacier, Greenland, to large calving events, and its future stability in the context of atmospheric and oceanic warming. Journal of Glaciology 58 (208): 229-239. Rignot, E. 1996. 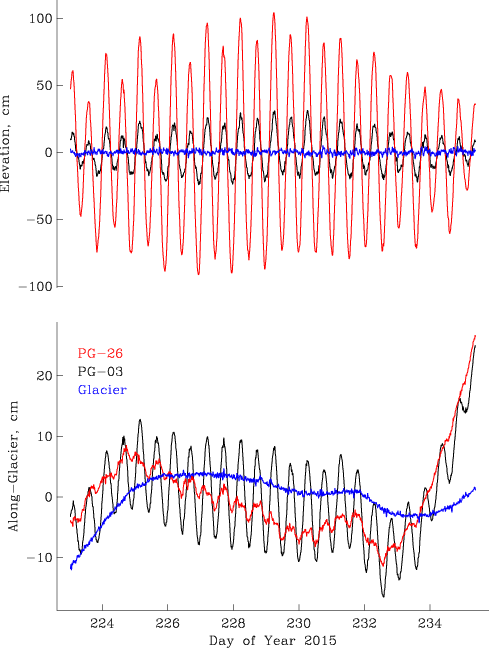 Tidal motion, ice velocity and melt rate of Petermann Gletscher, Greenland, measured from radar interferometry. Journal of Glaciology 42 (142): 476-485. Traveling by dog sled, Geologist Lauge Koch mapped Petermann Gletscher in 1921 after he and three Inuit companions crossed it on a journey to explore northern North Greenland. They discovered and named Steensby, Ryder, and H.C. Ostenfeld Glaciers that all had floating ice shelves as does Petermann (Ahnert, 1963; Higgins, 1990). In Figure 1 I reproduce the historic map of Koch (1928) that also contains his track in in 1917 and 1921 both across the terminus and across its upstream ice stream. In 1921 all four starved travelers returned safely after living off the land. Four years earlier, however, they were not so lucky: two traveling companions died on a similar journey in 1917 (Rasmussen, 1923). Only 20 years after Lauge Koch’s expeditions by dog sled, air planes and radar arrived in North Greenland with the onset of the Cold War. The Arctic Ocean to the north became a battle space along with its bordering land and ice masses of northern Greenland, Ellesmere Island, Canada, Alaska, and Siberia. Weather stations were established in 1947 at Eureka by aircraft and in 1950 at Alert by US icebreaker to support military aviation (Johnson, 1990). In 1951 more than 12,000 US military men and women descended on a small trading post called Thule that Knud Rasmussen and Peter Freuchen had established 40 years earlier to support their own and Lauge Koch’s dog-sled expeditions across Greenland (Freuchen, 1935). “Operation Blue Jay” built Thule Air Force Base as a forward station for fighter jets, nuclear armed bombers, and early warning radar systems. The radars were to detect ballistic missiles crossing the Arctic Ocean from Eurasia to North America while bombers were to retaliate in case of a nuclear attack from the Soviet Union. About another 60 years later, the jets, the bombers, and the communist threat were all gone, but the Thule Air Force Base is still there as the gateway to North Greenland. It is also the only deep water port within a 1,000 mile radius where US, Canadian, Danish, and Swedish ships all stop to receive and discharge their crews and scientists. Since 2009 Thule AFB also serves as the northern base for annual Operation IceBridge flights over North Greenland to map the changing ice sheets and glaciers. The establishment of military weather stations and airfields in the high Arctic coincided with the discovery of massive ice islands drifting freely in the Arctic Ocean. On Aug.-14, 1946 airmen of the 46th Strategic Reconnaissance Squadron of the US Air Force discovered a moving ice islands with an area of about 200 square that was kept secret until Nov.-1950 (Koenig et al, 1950). Most of these ice islands originated from rapidly disintegrating ice shelves to the north of Ellesmere island (Jeffries, 1992; Copland 2007), however, the first historical description of an ice islands from Petermann Gletscher came from Franz Boas in 1883 who established a German station in Cumberland Sound at 65 N latitude and 65 W longitude as part of the first Polar Year. Without knowing the source of the massive tabular iceberg the German physicist Franz Boas reported detailed measurements of ice thickness, extend, and undulating surface features of an ice island in Cumberland Sound that all match scales and characteristics of Petermann Gletscher (Boas, 1885). These characteristics were first described by Dr. Richard Croppinger, surgeon of a British Naval expedition in 1874/75 (Nares, 1876). Dr. Croppinger identified the terminus of Petermann Gletscher as a floating ice shelf when he noticed vertical tidal motions of the glacier from sextant measurements a fixed point (Nares, 1876). His observations on tides were the last until a group of us deployed 3 fancy GPS units on the glacier last summer. Vertical (top) and horizontal (bottom) motion of Petermann Gletscher from GPS referenced to a GPS base station on bed rock at Kap Schoubye. Note the attenuation of the tide from 26 km sea ward of the grounding line (red) to at the grounding line (black) and 15 km landward of the grounding line (blue). 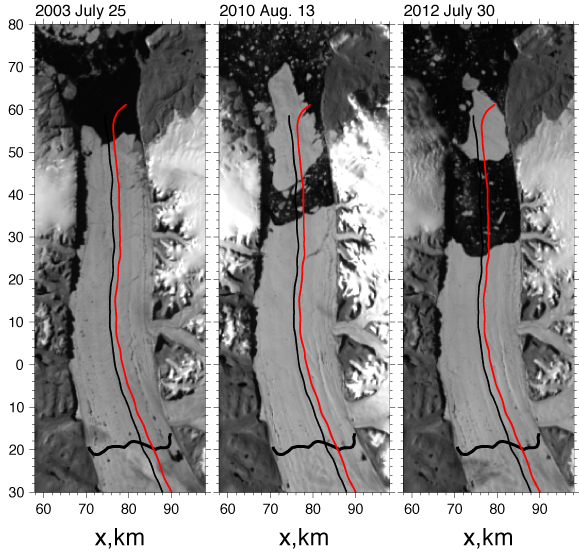 The horizontal location motion has the mean motion removed to emphasize short-term change over the much, much larger forward motion of the glacier that varies from about ~700 (black) to ~1250 meters per year (red). We have indeed come a far way during the last 150 years or so. Mapping of remote landscape and icescape by starvation and dog-sled has been replaced by daily satellite imagery. Navigation by sextant and a mechanical clock has been replaced by GPS and atomic clock whose errors are further reduced by a local reference GPS. These fancy units and advanced data processing allow me to tell the vertical difference between the top of my iPhone sitting on a table in my garden from the table. 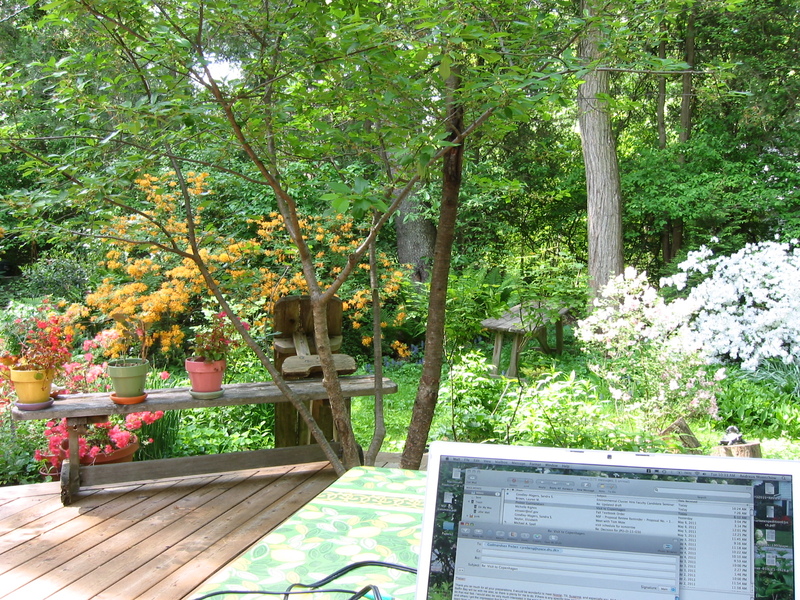 Working at in the garden at home preparing for field work near Petermann Fjord. P.S. : This is the first in a series of essays that I am currently developing into a peer-reviewed submission to the Oceanography Magazine of the Oceanography Society. The work is funded by NASA and NSF with grants to the University of Delaware. Ahnert, F. 1963. The terminal disintegration of Steensby Gletscher, North Greenland. Journal of Glaciology 4 (35): 537-545. Boas, F. 1885. Baffin-Land, geographische Ergebnisse einer in den Jahren 1883 und 1884 ausgeführten Forschungsreise. Petermann’s Mitteilungen Ergänzungsheft 80: 1-100. Copland, L., D.R. Mueller, and L. Weir. 2007. Rapid loss of the Ayles Ice Shelf, Ellesmere Island, Canada. Geophysical Research Letters 34 (L21501): doi:10.1029/2007GL031809. Freuchen, P. 1935. Arctic adventures: My life in the frozen North. Farrar & Rinehard, NY, 467 pp. Higgins, A.K. 1990. North Greenland glacier velocities and calf ice production. Polarforschung 60 (1): 1-23. Jeffries, M. 1992. Arctic ice shelves and ice islands: Origin, growth, and disintegration, physical characteristics, structural-stratigraphic variability, and dynamics. Reviews of Geophysics 30 (3):245-267. Johnson, J.P. 1990. The establishment of Alert, N.W.T., Canada. Arctic 43 (1): 21-34. Koch, L., 1928. Contributions to the glaciology of North Greenland. Meddelelser om Gronland 65: 181-464. Koenig, L.S., K.R. Greenaway, M. Dunbar, and G. Hattersley-Smith. 1952. Arctic ice islands. Arctic 5: 67-103. Münchow, A., L. Padman, and H.A. Fricker. 2014. 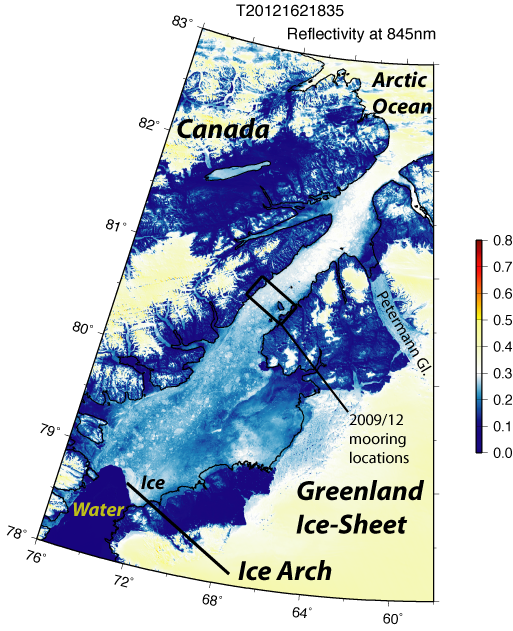 Interannual changes of the floating ice shelf of Petermann Gletscher, North Greenland, from 2000 to 2012. Journal of Glaciology 60 (221): doi:10.3189/2014JoG13J135. Rassmussen, K., 1921: Greenland by the Polar Sea: the Story of the thule Expedition from Melville Bay to Cape Morris Jessup, translated from the Danish by Asta and Rowland Kenney, Frederick A. Stokes, New York, NY, 327 pp. The Arctic Ocean is a puddle of water covered by ice that melts, moves, and freezes. Grand and majestic rivers of Siberia and America discharge into the puddle and make it fresher than Atlantic Ocean waters. The fate of the Arctic freshwater helps decide if Europe and the US become warmer or colder, experience more or less storms, droughts, or floods, and if global sea level will rise or fall. In a nutshell: the fate of Arctic freshwater determines climate. Arctic Ocean with Nares Strait study area (red box) with tide gauge locations as blue symbols and section of moored array as red symbol. Contours are bottom topography that emphasize ocean basins and continental shelf areas. Nares Strait connects the Arctic and Atlantic Oceans to the west of Greenland. It is narrower than Fram Strait, but it transports as much fresh ocean water as does its wider sister facing Europe. Few people know this, including climate scientists who often model it with a bathymetry that is 10,000 years out of date from a time when Nares Strait did not yet exist. This is why the US National Science Foundation funded a group of oceanographers to use icebreakers, sensors, computers, and innovative engineering to collect and analyze data on the ice, the water, and the atmosphere. 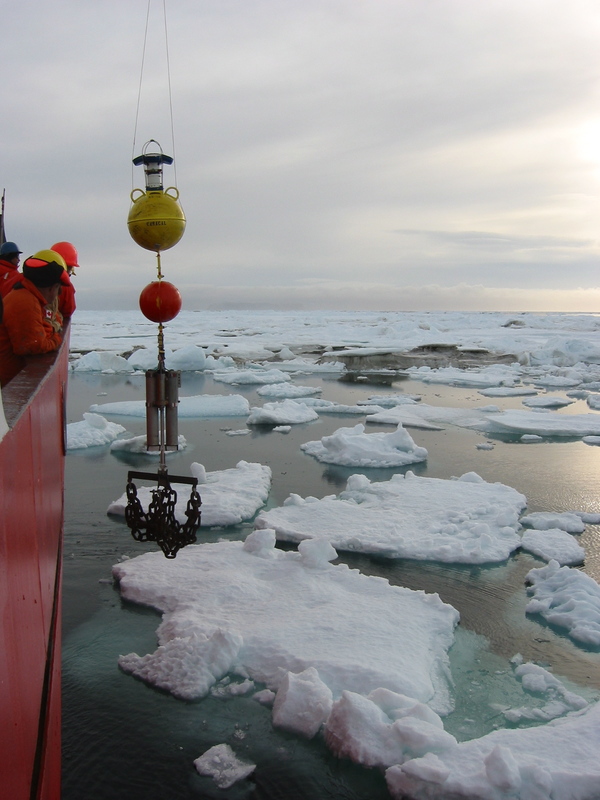 Acoustic Doppler Current Profiler mooring deployment in Nares Strait from aboard the CCGS Henry Larsen in 2009. Within days of the start of the grant I had to appear before the US Congress to answer questions on Petermann Glacier that discharges into Nares Strait. In 2010 a large 4-times Manhattan-sized ice islands broke off and people wanted to know if global warming was to blame. I was asked how ocean temperatures and currents relate to this and other events and what may happen next. My few data points were the only existing data for this remote region, but I had not yet had the time to analyze and publish much. Two years later another large 2-Manhattan sized ice island formed from the same glacier, but this time we were better prepared and people world-wide went directly to our data, thoughts, and stories when this blog was sourced in news papers in France, Germany, and China. Al Jezeraa, BBC, and PBS reported on it, too, giving me chance to connect via TV, radio, and pod-casting to a larger public. Petermann Gletscher in 2003, 2010, and 2012 from MODIS Terra in rotated co-ordinate system with repeat NASA aircraft overflight tracks flown in 2002, 2003, 2007, and 2010. Thick black line across the glacier near y = -20 km is the grounding line location from Rignot and Steffen (2008). While it was exciting and fun to share Nares Strait and Petermann Gletscher physics with a global audience, it is not what we had planned to do. Our goal was to put real numbers to how much water, ice, and freshwater was moving from the Arctic to the Atlantic via Nares Strait. So the next 3 years we labored through our extensive records to first describe and then to understand what was happening in Nares Strait. We found that ocean currents move water always to the south no matter if ice covers Nares Strait or not, no matter if the ice is moving or not, no matter which way the wind is blowing. The physical cause for this southward flow is that the sea level is always a few inches higher in the Arctic Ocean than it is in Baffin Bay and the Atlantic Ocean to the south. Linear regression of volume flux through Nares Strait from current meters with along-strait sea level difference from tide gauges. (unpublished). We know, because we measured this with tide gauges that we placed in protected coastal bays. We recovered 3 sensors; most rewarding was the recovery of one sensor that we had failed to reach in 2005, 2006, 2007, and 2009, but in 2012 we finally got the instrument and 9-years of very good data. Batteries and computers inside were still running and recording. I have never seen as clean and as long a time series. Results from a 2003-12 tide record shown as a power spectra with named tidal constituents at diurnal (~24 hours) and semi-diurnal (~12 hours) periods. Data are shown as the relative amplitudes of oscillations at frequencies in cycles per day or cpd. 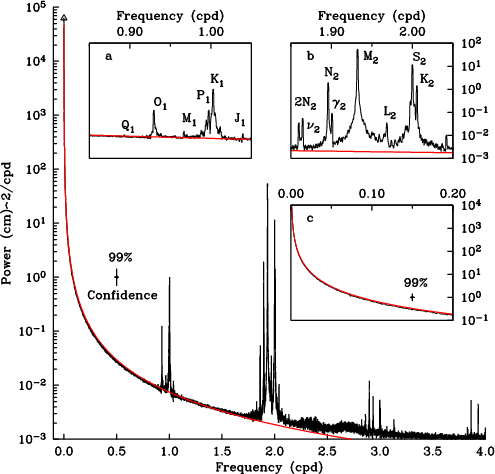 The red line is a modeled red noise spectra (unpublished). From satellite data that we analyzed as part of this grant, we know when the ice moves and when it stops moving. 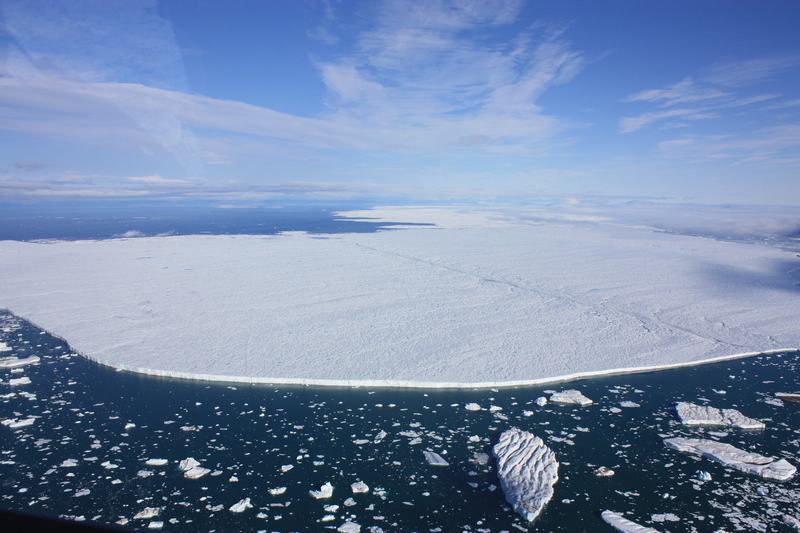 The freeze-up of Nares Strait comes in one of three forms: 1. Ice stops moving in winter, because an ice barrier (ice arch or ice bridge) forms in the south that blocks all southward motion of ice; 2. only new and young ice moves southward, because an ice barrier forms in the north that blocks all entry of Arctic ice into Nares Strait; and 3. 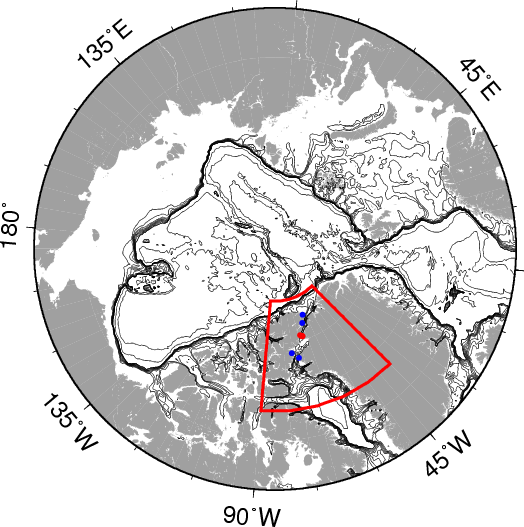 Arctic ice moves freely through Nares Strait, because no ice barriers are present. Our 2003-12 study period covers years for each of these different ice regimes. And each of these regimes leads to very different ocean (and ice) flux as a result of very different ocean physics. Data alone cannot make definite statements on what will happen next with our climate, but we know much new physics. The physics suggest certain balances of forces and energy for which we have mathematical equations, but these equations must be solved on computers that can only approximate the true physics and mathematics. These computer models are our only way to make predictions ito the future. The data we here collected and our analyses provide useful checks on existing models and will guide improved models. June-10, 2012 MODIS-Terra image showing location of moored array that was deployed in Aug. 2009.